Home / NEWS / THE VENGEANCE OF SHE arrives on Blu-ray February 26 from Scream Factory! Highly sought-after Hammer Film cult classic Is Finally Released! THE VENGEANCE OF SHE arrives on Blu-ray February 26 from Scream Factory! Highly sought-after Hammer Film cult classic Is Finally Released! A young beautiful woman named Carol (Olinka Berova) is plagued by hallucinatory voices calling her “Ayesha” and is drawn by a mysterious force toward the east. During her voyage, she meets Dr. Philip Smith (Edward Judd) who decides to accompany Carol to her unknown destination. Eventually the two reach the lost city of Kuma where Carol is greeted as the reincarnation of Queen Ayesha, the beloved of King Killikrates (John Richardson). Philip is imprisoned and meets Za-Tor (Noel Willman) who tells him of the high priest’s deceitful plan to obtain the secret of immortality by bringing back Ayesha to King Killikrates. Will Philip escape in time to reveal the truth and save Carol from destruction? Meet The Cast Of Sons Of Anarchy! Kurt Sutter! Katey Sagal! Theo Rossi! Get Together To Help Hurricane Sandy Victims! SDCC! Walking Dead Announces Season 8 Premiere! Art Release! San Diego Comic Con 2013! 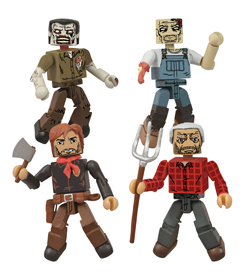 13 New Diamond Select Toys Exclusives! The Walking Dead! Wolverine! Lost In Space! Star Wars! Deadpool! And More! Veronica Mars Movie News! Kickstarter Campaign Breaks 5 Million Bucks! Comic Con News! T-Shirts And More!